In most cases, you cannot see the actual PropGet() and PropSet() methods; access for simple properties is implemented directly within the Caché virtual machine for optimal performance. You can, however, provide PropGet() and PropSet() methods for a specific property, as long as that property is not object-typed or multidimensional. If you define these methods, the system automatically invokes them at runtime. The following sections describe how to define these accessor methods. Within the custom methods, you can perform any special processing that your application requires. As noted earlier, it is not supported to override accessor methods for object-typed properties. If you need to define a property that holds object values and you need to define custom accessor methods, define the property with the type %CacheString. This is not an object class but is rather a generic class, and it is permitted to override the accessor methods for this property. 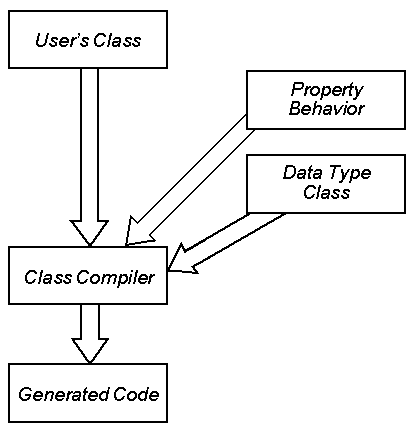 When using the property, set it equal to an instance of the desired class. For example, the following class includes the property Zip, whose formal type is %CacheString. The property description indicates that the property is meant to be an instance of Sample.USZipCode. The class also defines the ZipGet() and ZipSet() property methods.